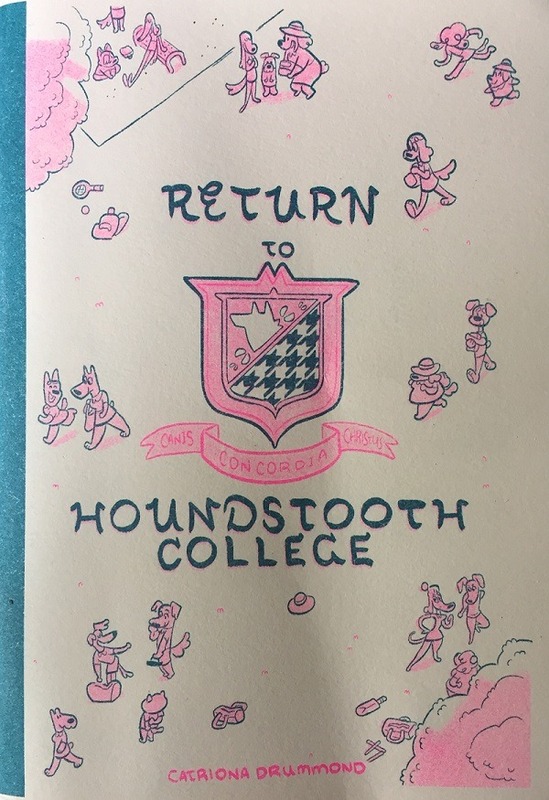 * After a long absence, Leon K. is back writing about comics, this time turning an eye to the world of YA comics with a look at RETURN TO HOUNDSTOOTH COLLEGE by Catriona Drummond, noting "With its honing in on the specific liminal moment between adolescence and adulthood where one is forced to come to terms with the chimera that is the pull towards an idealised, supposedly simpler period of one’s former youth, Houndstooth is a coming-of-age story that fits into the last decade’s swell of comics-form fiction created to cater to the relevant issues and concerns faced by readers perched on the verge of adulthood – I’m thinking specifically of the output exemplified by publishers like First Second or Scholastic – but which pitches itself to an audience who can identify with the perspective of someone looking backwards, parsing their memories of the disappeared moments from their time spent on this precipice." * John Seven reviews WOLF by Rachael Ball which "finds the people forced into change typically learn to adapt, and people faced with darkness typically learn how to live with it." * Ryan Carey looks at UNDERSTANDING by Becca Tobin, writing "Artifice, acquisition, and gluttony are easy enough concepts to shower with disdain, of course, especially when they become ritualized norms, but Understanding does something entirely different by acknowledging the inherent appeal of this ritualization while refusing to either take it too seriously or let it off the hook." * Rob Clough reviews FRONTIER #17: MOTHER'S WALK by Lauren Weinstein, writing "Weinstein's commitment to being present with her fears and dreams in the moment was a constant on every page, anchoring its flights of fancy with almost painfully visceral images." 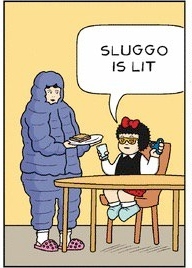 * Abraham Riesman interviews OLIVIA JAIMES, the cartoonist creating the new Nancy strips, "about the secret origin of her much-memed “Sluggo is lit” panel, the contents of her iPhone notes about strip ideas, and the overlap between “Nancy” and The Good Place." * Robin McConnell interviews LEIF GOLDBERG "about his new book from 2dcloud, Lost In The Fun Zone. 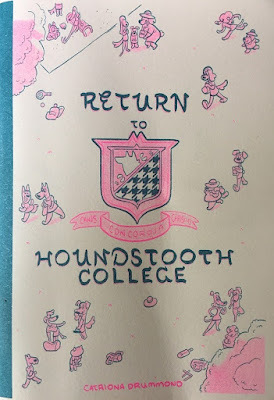 We also cover a range of work including his time in Fort Thunder, recent mini comics, yearly calendars and animation." * Jennifer Hayden interviews MARIA AND PETER HOEY about their Coin-Op series. * Derek Royal and Stergios Botzakis interview KATRIONA CHAPMAN about her amazing new book from Avery Hill, Follow Me In. * Alex Dueben interviews DAVID SMALL about his new book, Home After Dark, "its long process, and his love of irresolution." * Karl Stevens has a comic up on The New Yorker site called A CAT LIES IN WAIT. * There's a new Seo Kim comic on Vice called HOW TO TRICK YOUR CATS. * And a new Tara Booth comic on Vice called HOROSCOPE. * Joseph Dottino has a comic up on The Believer site called THE BAKER. * Not comics, but it is Nick Hanover, and he's written this wonderful and personal piece for The Cultural Gutter called WALKING ARM IN ARM WITH A LIE: VELVET GOLDMINE AT 20. * It's Starting! It's "Best Of" Season! There have probably been others, but the first one I've seen out in the wild is on the AV Club site. Oliver Sava and Caitlin Rosberg provide an interesting mix of comics big and small (and web) in their THE BEST COMICS OF 2018. * Matt O'Keefe writes this informative piece for The Beat titled THE FRAUD PHENOMENON: HOW IMPOSTER SYNDROM PLAGUES CREATIVES. * And finally, this long THREAD by Evan Dorkin kinda broke my heart this week.